This summer, we were thrilled to return to the Camargue in the South of Provence, also known as the Wild West of France. For the second time, we got to experience one of the most exciting highlights on our Provence Photo Tour: Photographing the world-famous white horses charging through the marsh. Here is a short video which gives you an idea of this exciting experience. Also find a sweet 1953 short film (Crin Blanc – White Mane) about the white horses directed by French filmmaker Albert Lamorisse at the very bottom of this post. 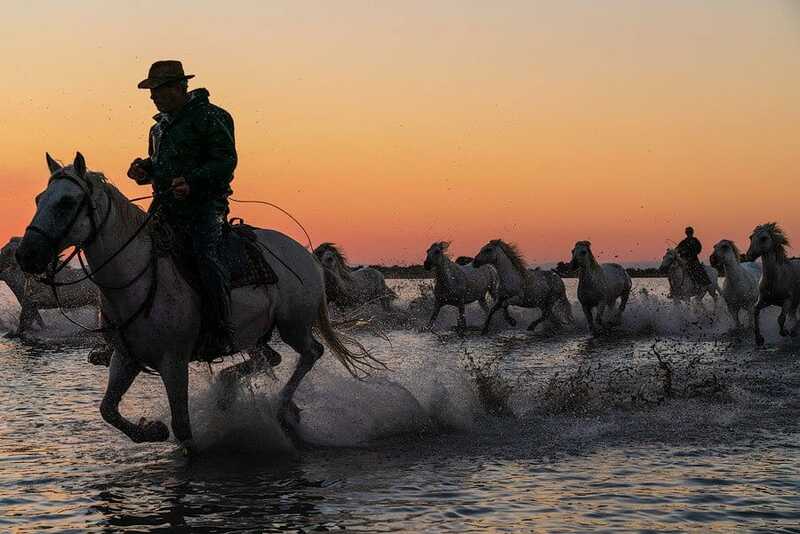 The Camargue is Western Europe’s largest river delta – a fascinating region of swamps, marshes, rice paddies and medieval villages like Aigues Mortes which used to be the main Mediterranean departure point for the Crusaders. It is known for its UNESCO designated wildlife reserve with white flamingos and thousands of birds as well for the annual festival in Saintes Maries de la Mer in honor of the Black Sara, patron saint of the gypsies. 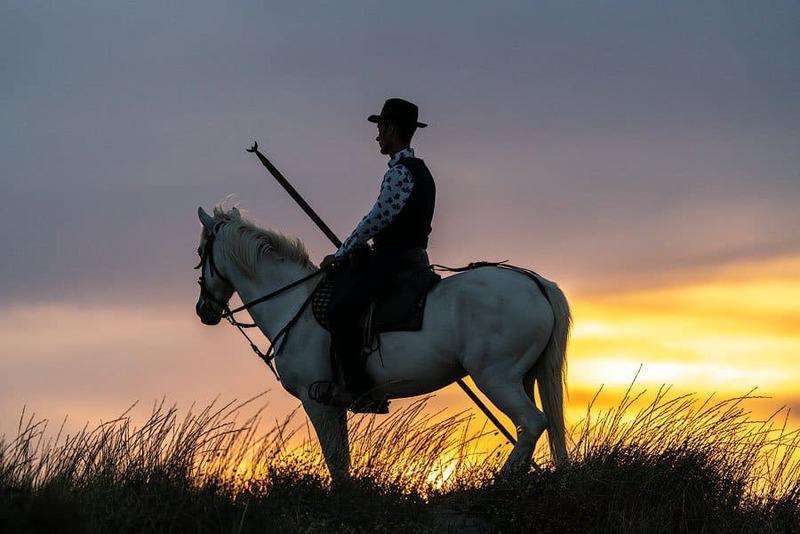 For us photographers, the draw are the beautiful white horses and the 4 photo sessions we arrange with them, 2 in the early morning starting before sunrise and 2 in the evening ending past sunset. Each session takes place in a different location. The basic setup is that the local cowboys called Gardiens safely guide the horses toward a line of photographers at thunderous speed and we all turn into rapid-fire sports photographers, trying to capture the movement and excitement of each run. It’s quite exhilarating. 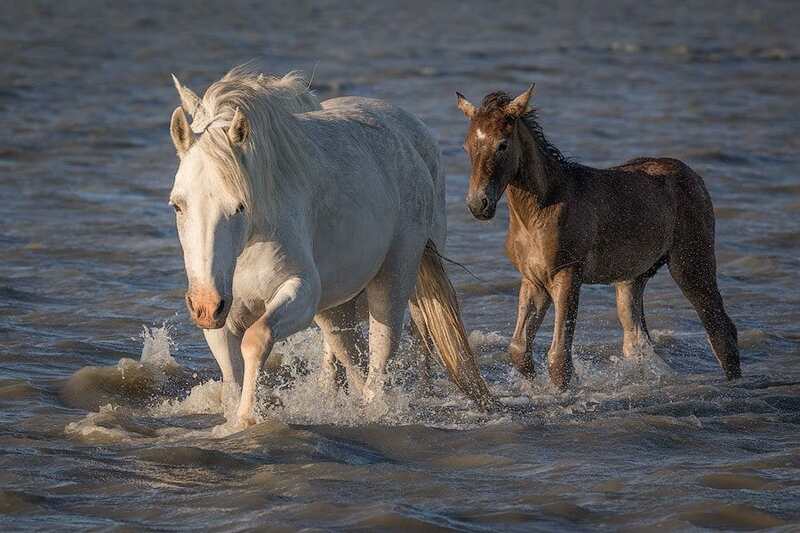 The Camargue horse is one of the oldest breeds of horses and indigenous of the harsh wetlands of the Camargue. 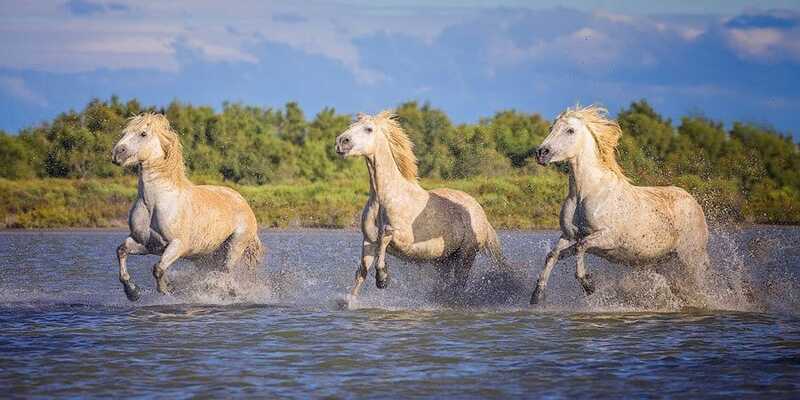 Camargue horses live almost free within the marshes of the Rhone Delta throughout most the year. They are rounded up annually for health inspections and branding. They are relatively small horses which are born black or dark brown and change to a pale grey or white in adulthood. These horses have a sweet temperament and they are curious, checking our backpacks for treats and leaning their big white heads on our shoulders during rest periods. Jim and I are not horse people but we love interacting with these friendly creatures. 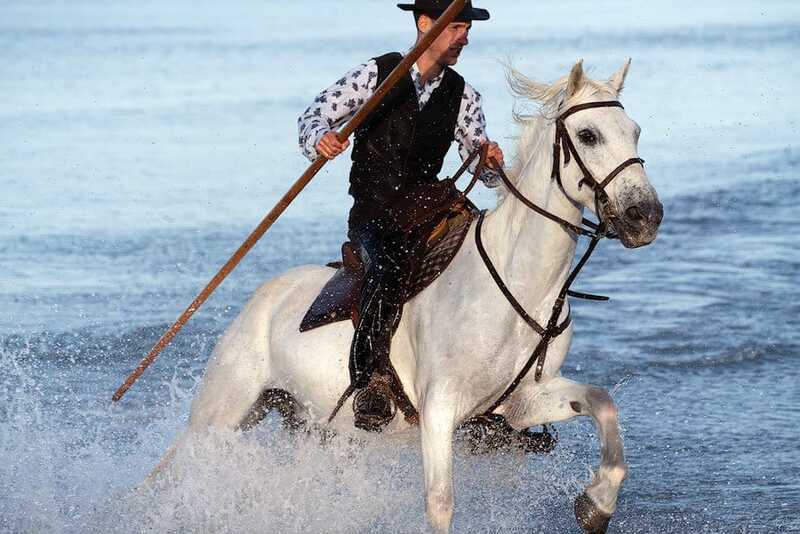 A Camargue cowboy called a Gardien guides his white horse through the surf. Sunset in the Camargue as the Gardiens herd their white horses back to the stables. 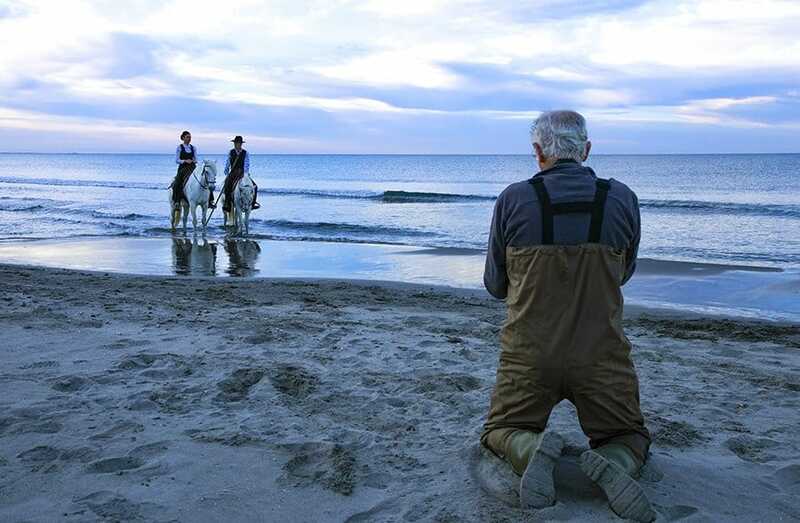 Here is Dave, our tour participant from England, photographing 2 Gardiens in traditional costume at sunrise in the Camargue. 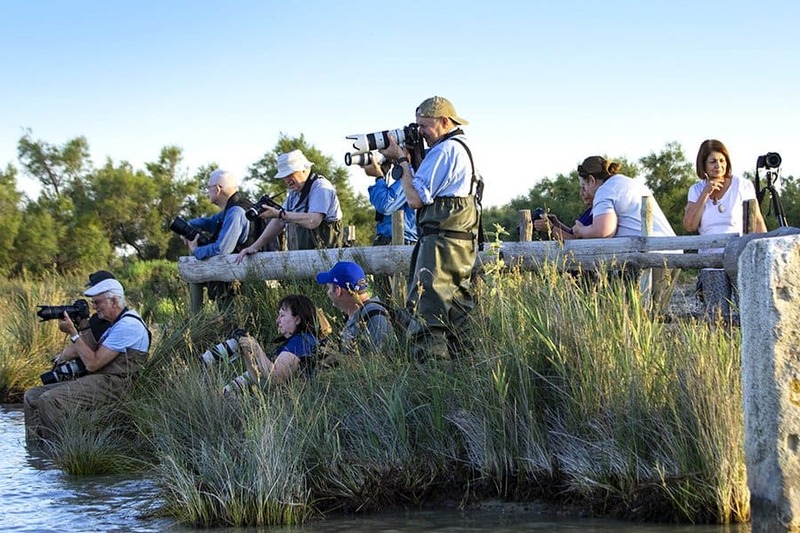 For the 4 sessions with the horses, we provide waders for each tour participant and we work with Patrice, a local professional photographer. He organizes the shoots, helps us get the correct settings for best results dialed in and communicates with the Gardiens during the runs. There are roughly 8 runs during each photo shoot, depending on how playful and energetic the horses are feeling. The waders are wonderful as they allow us to walk into the surf or kneel in the mud for the best angle. Once the action starts, we don’t want to worry about getting muddy or wet. These photoshoots really are fantastic: A combination of calm, peace and quiet before and between runs and then a rush of energy and hightened awareness and presence when the horses race toward us and past us for a few minutes at the time. Mare and foal are taking a leisurely break between photo shoots. A moment of “quiet before the storm” as our Provence Photo Tour group gets ready for the next run of the white horses. In between runs we get to do some “chimping,” adjust our settings if needed, take a deep breath and get in position for the next run. The best part . 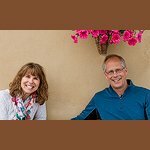 . . we get to do it again during our Provence Photo Tour in 2019. Come and join us for an unforgettable adventure. Stillness after high-energy action at sunset in the Camargue.